With colonial architecture, Communist landmarks, and Buddhist heritage, Hanoi offers a glimpse of Vietnam at its most picturesque and vibrant. Explore the city on a full-day guided tour that takes in Old Quarter sights, ancient temples, and Hoan Kiem Lake, with round-trip hotel transfer, a Vietnamese lunch, and entrance fees included. Begin with pickup at your hotel, then start the day at Tran Quoc pagoda, a Buddhist temple set on a West Lake peninsula, and one of the oldest pagodas in Vietnam. 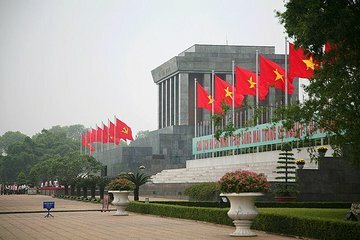 Continue to the Ho Chi Minh complex, which remembers the Communist leader—known by many Vietnamese people as Uncle Ho—with botanical gardens, his former house, and the One Pillar Pagoda. Explore Confucian heritage at the 11th-century Temple of Literature, where you’ll find a prime example of traditional Vietnamese architecture and the site of Vietnam’s first university. Finish the morning with lunch at an Old Quarter restaurant. The afternoon program depends on the day: on Monday, Wednesday, and Friday, you’ll visit the traditional ceramics village of Bat Trang to see showrooms, with demonstrations of how the distinctive handicrafts are made. All tours make the final stop of the day at Hoan Kiem Lake, a scenic spot at the very center of Hanoi. Visit Ngoc Son Temple, or ‘the Temple of the Jade Mountain,’ which is dedicated to a warrior, a saint, and a scholar. This tour concludes with drop-off at your hotel. Too much time was spent in a very crowded enamel painting workshop, and we were told too little about city landmarks as we passed them on the bus. Explanation was OK on the sites we visited, but nothing on the history of Hanoi. We visited all the important sites. The tour guide was very informative. Lunch was superb and they took care of my dietary requirements well. The itinerary was find for the tour. The tour guide was average and not one of the best as compared to our other trips . After few hours , the places become monotonus and we had to drop after at the last leg of trip . If you have less time and many things to cover , do book the tour and see the things . Tour guide are amazing. Hanoi City Tour is very educational. I salute the Vietnamese people because they value their heritage. good all-round tour of city. This is a value for money tour that gives a highlight of Vietnamese culture, religion and character through the major tourist destinations in the comfort of a mini bus. Tour guide Son is engaging and quite knowledgeable about history and other unwritten historical accounts and anecdotes about his country and political figures. Lunch was very good at Orchid Restaurant and cooking class at Hang Bay Rd. which we revisited. I enjoyed the tour. The locations which were visited were interesting. I was intrigued by the Viet Nam lacquer artwork showroom.